My best memories at the University of Helsinki are connected with the Department of Ethnology and my dissertation. When I was writing my Master's thesis on the history of ethnology, I was asked to substitute for a research associate at the Department of Ethnology, and the following year I was hired for the position. This opened up an academic career that I hadn't even known to dream of. Us research associates formed a good team, and Professor Juhani U.E. Lehtonen was a fair boss. Professor of Ethnology Juhani U.E. Lehtonen and research associates Hanna Snellman and Sanna Kaisa Spoof in period finery at the opening of the Topelia building of the University. 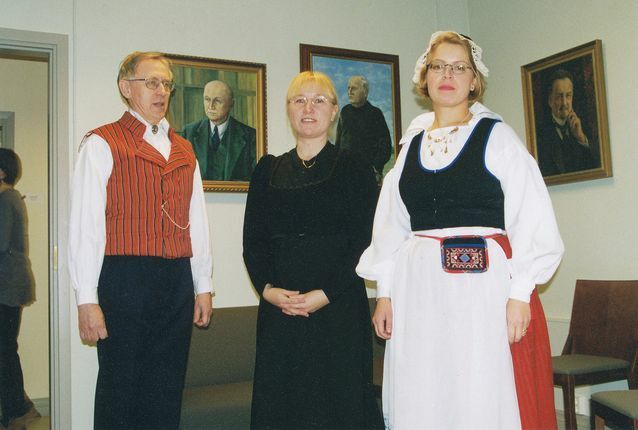 On the walls of the professor's office his predecessors look on; in the centre, a portrait of Kustaa Vilkuna painted by Professor Lehtonen. Photo: Collection Sanna Kaisa Spoof. My most important teaching duties were proseminars. My forte became teaching a museum class at the Viikki Agricultural Museum of the University of Helsinki, among the ard ploughs and wooden pails. Running a fieldwork class on collecting textile handicraft traditions in Iitti, my family's native district, was a memorable experience. Teaching was fun and the students were nice. In 1997, in my dissertation, I traced the evolution of the social and physical environment of the Jokela brickworks and its associated farm from the 1870s to the 1950s. These are the roots of the urban industrial area of Jokela, in the municipality of Tuusula, and to my surprise the people of Jokela gave the book an enthusiastic reception. My dissertation is still eagerly read in Jokela as local history, and since it is sold out, there have been requests for a reprint. I am also proud that my dissertation was splashed across the front page of Helsingin Sanomat, the leading newspaper in Finland. 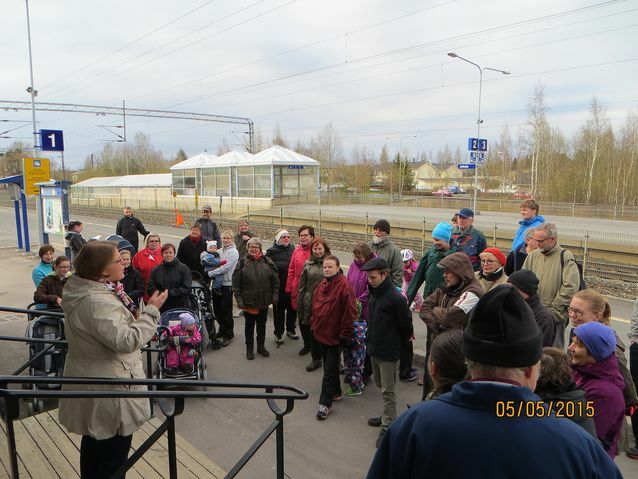 Dr Sanna Kaisa Spoof lecturing on the history of Jokela as brickworks town on the culture walk of Jokela adult education centre, Jokela station, May 2015. Photo: Collection Sanna Kaisa Spoof.